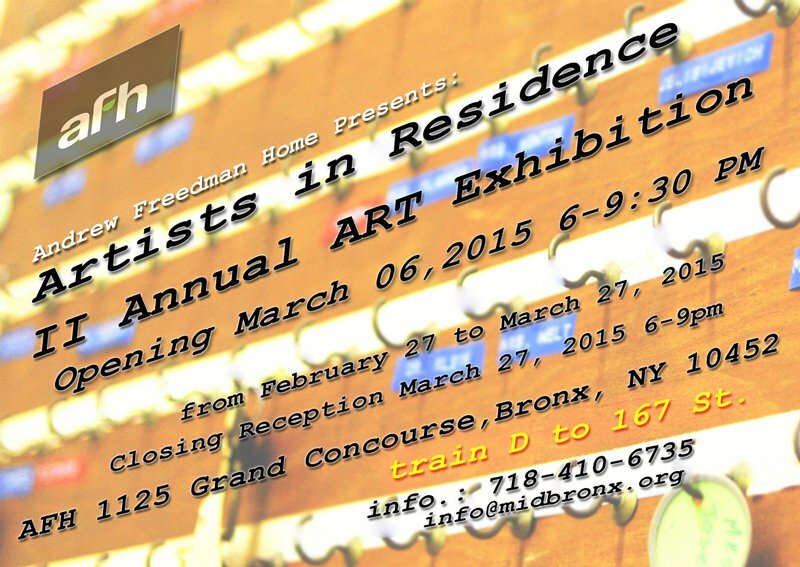 The Andrew Freedman Home is pleased to announce the 2nd annual Andrew Freedman Home | Artist in Residence exhibition. From February 27, 2015 – March 27, 2015, The Barcid Gallery at the Andrew Freedman Home, part of the historic Concourse district of the Bronx, will host an exhibition featuring the works of 15 artists taking part in this year’s residency program. Artists in Residence include: Jason H. Alloway, Gaston Serapihin Amougou, Michele Brody, Melissa Calderon, Donna Diamond, Xavier Figueroa, Josue Guarionex, DJ Kool Herc, Valarie Irizarry, Aaron “SpazeCraft” Lazansky-Olivas, Jose “Dr. Drum” Ortiz, Kenya K. Smith, Christie Takahashi, Andre Trenier, Megeru Yamaguchi. AFH | AIR II, organized by Resident Artists Josue Guarionex and Melissa Calderón, will have its opening reception on Friday, March 6, 2015 at the Andrew Freedman Home, 1125 Grand Concourse beginning at 6pm. The event will include live music collaboration by Resident Artists Aaron “SpazeCraft” Lazansky-Olivas and Jose “Dr. Drum” Ortiz, melding Puerto Rican Bomba with digital beats and technologies. As well, Resident Artist Kenya K. Smith will be previewing his new fashion line created at Andrew Freedman that evening with live models at 7:30pm. Bronx Brewery Ale, an official sponsor for the exhibition, will be served. The Artists Studios are economic development tools for working artists in the Bronx. The Andrew Freedman Home, Artist in Residence Program (AFH | AIR) provides a selected group of artists with studio space, technical support, and the opportunity to exhibit their work in our gallery spaces. The AFH | AIR program encourages experimentation and exploration within the historic mansion. In exchange, artists commit to one year of volunteering for 20 hours per month to provide community services to MBSCC programs. The goal of the studios is to provide artists with the means and support to create self-sustaining businesses while providing a means of support for the vibrant art community in the Bronx.